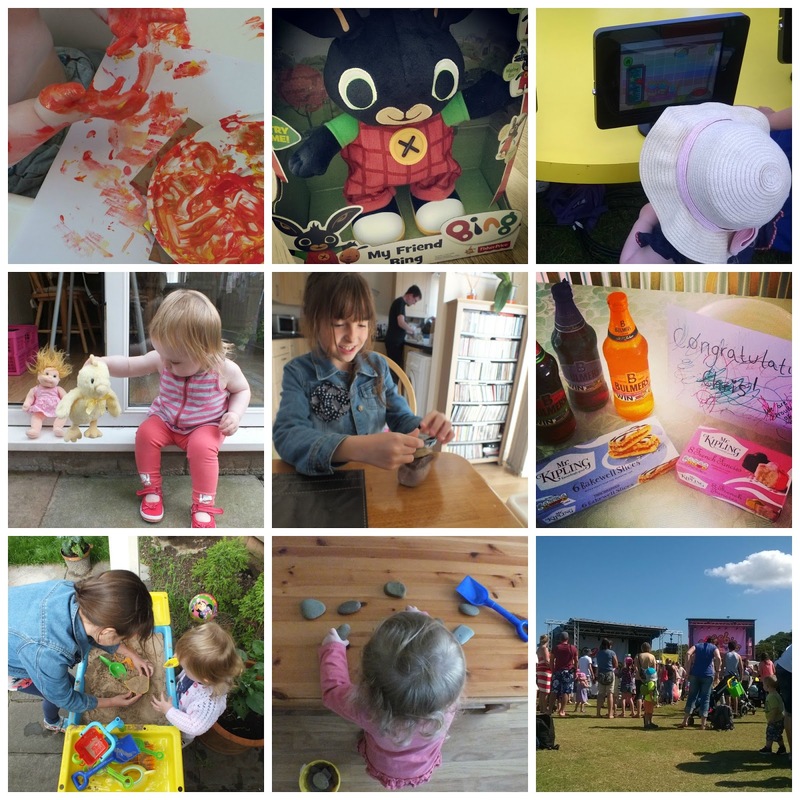 from a whisper to a roar: July Round-Up: jobs and things. July Round-Up: jobs and things. July has passed by in a whirl of colour and noise and activity and a little bit of stress and a lot of excitement. Now three years sounds like a long time but given how fast the last two years have gone, I know they will fly by. I started to think about how I will long for days like these, quiet play in the garden, just the two of us. Then I thought about the fact that we may not be in this house, enjoying this garden: that is the issue with renting, the lack of ability to tie down proper roots in one building, not allowing yourself to get to attached to a particular place. This panicked me. Just for a bit. I thought about how much I want to just cling onto now and not let it go. Then I rethought it. I have been fortunate enough to have many 'I don't want this to end' moments in my life, and all of them have ended or changed in some way - the crazy, heady feeling of falling in love turning into a more mature, deeper kind of love; holidays in beautiful places ending; the last day in a job that I enjoyed. But all those things have been replaced by even more I-don't-want-this-to-end moments. And that is how it is. Some things change, some things end. But God gives us things to enjoy and to be thankful for. The point of life is not to cling tightly to the gifts we are given, to claim ownership over everything we touch, to get attached to things and places; the point is to look at those things given, give thanks for them, and think how can I share this and who can I share it with? I share these beautiful times with my daughter, my husband, and our family and friends, and I am so grateful for every last bit of it. We've been doing lots of crafty stuff over the past couple of weeks, especially as I've had my niece for longer than normal as the schools are out for the summer. I've got some posts planned about this. Anything that drags my niece away from Minecraft for a few minutes is a good thing indeed ;) so I'm trying hard to keep her and my daughter occupied. There's a seven year age gap between them so trying to keep them both happy with the same activity is interesting, but it's definitely doable. 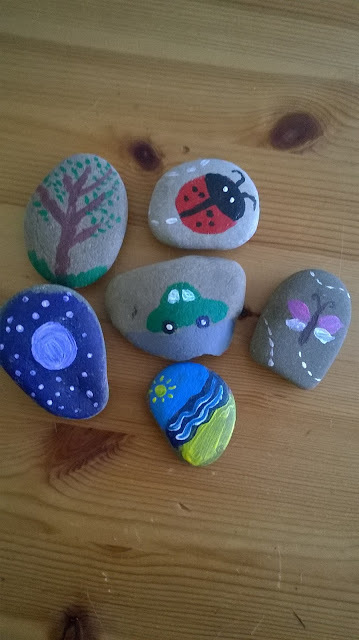 Painting stones: more relaxing than grown-up colouring books. I have decided. Anyway, expect some summer crafty type posts soon! I have also been sent a couple of books to review this month. Yay! I've finished one already, which I will be reviewing shortly. This particular book made me really want to start a book club. I've been into non-fiction for the past couple of years, so it would be nice to get back into novels. 30,000 words later and I am done! I have learnt a lot from it, so it was well worth doing. As much as I thought I'd feel relief when it was over, I actually kind of miss that focused writing time. This month has seen us both completing application forms, sending out CV's, preparing for interviews, doing I-have-nothing-to-wear-oh-help-me panicking (alright, that last one was just me). And while I haven't been successful, Chris has! He starts his new job on Monday, after seven years working at his previous job (which he thought was alright, but not that exciting or fulfilling). His new job definitely is exciting and fulfilling and I am so proud and excited for him. It also means we are a bit more sure about what direction we are headed in as a family. Which is nice. Summer activities for your sand and water table! Summer activity - Ice cream and cookie playdough!